Korea’s ratio of self-employed people to its working population stands at 23.2 percent, the fifth highest among the 34 member states of the Organization for Economic Cooperation and Development, according to a report recently released by a research arm of the National Assembly. The four countries with higher figures are Greece (31.8 percent), Mexico (27.5 percent), Turkey (23.9 percent) and Italy (23.7 percent). What is common with the top four is that their economies are heavily reliant on tourism. The percentages for most other developed countries remain far below 20 percent, going down into single digits for Canada, Norway and the U.S. The report drawn up by the National Assembly Budget Office noted Korea placed second only after Greece in terms of an international comparison index factoring in a set of economic and social conditions, including per capita gross national income and unemployment rate. Korea’s score was 190.58, compared with 193.64 for Greece, on the index with the score of 100 meaning a country’s desirable and actual ratios of the self-employed to its workforce are tied. The report is yet another sharp reminder of the excessive competition and other problems facing the country’s self-employed people. The number of self-employed workers showed a rapid increase in Korea in the wake of the 1997-98 Asian financial crisis when many salaried workers were laid off. The figure gradually declined in the 2000s before rising again for years to 7.1 million in August 2012, showed data from Statistics Korea. In recent years, the number of self-employed people has seen a slight decrease. It is notable, however, that more people in their 50s and above have started their own businesses, with the age group’s proportion of self-employed people increasing by more than 10 percentage points over the past decade. This trend is attributed mainly to the fact that a growing number of retired workers from the baby boomer generation ― born between 1955 and 1963 ― have opened their own businesses. Often with small sums of money and insufficient preparations, most of them opt to start operations in already-bustling areas. For instance, thousands of fried chicken outlets have sprung up annually across the country over the past several years. Given these circumstances, it is only natural that more than 41 percent of self-employed people said in a survey that they regarded nearby self-employed businesses as their major competitors. This fierce competition leaves self-employed businesses struggling with poor profitability, with more than half of them unable to survive for longer than three years. A poll of about 10,000 self-employed businesses, conducted by the Small Enterprise and Market Service in 2013, showed that only 19.4 percent of them earned more than 3 million won ($2,590) per month, with 17.8 percent making less than 1 million won and 53.6 percent earning between 1 million won and 3 million won. The remaining 9.2 percent suffered losses or managed to break even. What is particularly worrisome is that the amount of debt owed by self-employed households has been rising at a rapid pace with their income having barely increased or even decreased. 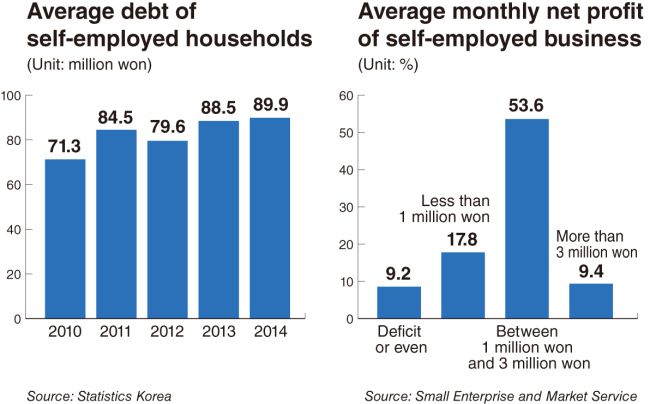 The average debt of self-employed households continued to climb from 79.6 million won in 2012 to 88.5 million won in 2013 and 89.9 million won in 2014, according to figures from the state statistical office. Data released by the Bank of Korea on Sunday showed bank loans extended to self-employed people increased by 23.3 trillion won in the first nine months of the year to 232.6 trillion won at the end of September. The sharp rise in loans, which results partly from the central bank’s measure to keep interest rates at a record low level for a year, suggests many unprofitable self-employed businesses keep themselves afloat by borrowing money amid a prolonged economic slump. This raises the concern that failures of indebted self-employed businesses not only put many households in poverty, but also inflict serious damage on the country’s financial stability. The report by NABO suggested that the government should shift the policy focus from providing financial assistance to self-employed people as part of efforts to reduce the jobless rate to helping them start businesses after making thorough preparations and avoid joining excessively competitive areas. Experts raise the need to set up an effective education system for prospective self-employed people and forge a self-regulatory environment, under which specific information on the competitive situation of certain businesses is provided on a regular basis. What is more important is to create more opportunities for the retirees to be reemployed so that they will not be forced to turn to self-employment, they say.